Sorry for the quick, crappy picture. While I was in Kmart, a massive thunderstorm was moving toward my house and I had wash on the line, so I was sort of hustling to get out of there. My first thought (besides how wet my clothes on the line were going to get) was that they are very pretty colors, and it’s a nice change from the neon collections that pretty much every other brand puts out in the summer. My second thought was that some of the colors looked really similar to the colors in the regular Xtreme Wear line. 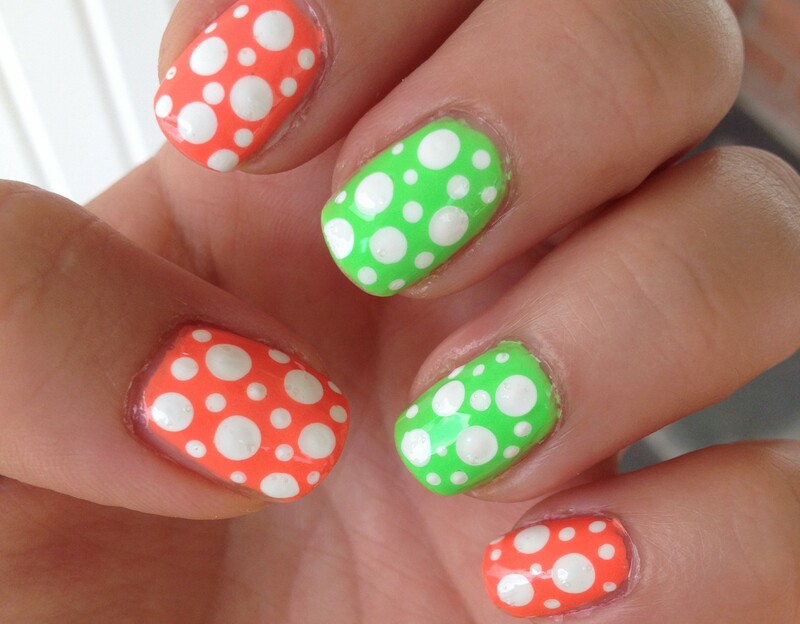 So, I marched my self over to the regular line of polish and did a little comparison. That’s Kelp Yourself from Electric Summer on the left, and Mint Sorbet on the Right. Mint Sorbet might be a little more yellow, than Kelp Yourself, but I say these are REALLY close. That’s Wet Suit from Electric summer on the left and Breezy Blue on the right. Wet suit is a little bit darker, but again, these are really close. That’s Water Orchid from Electric summer on the left and Lacey Lilac on the right. These two aren’t as close of a match as the other two, but they’re not so different either. I just notices something: the Xtream Wear logo is a little different on the Lacey Lilac label than on the other bottles. Must be an old bottle. 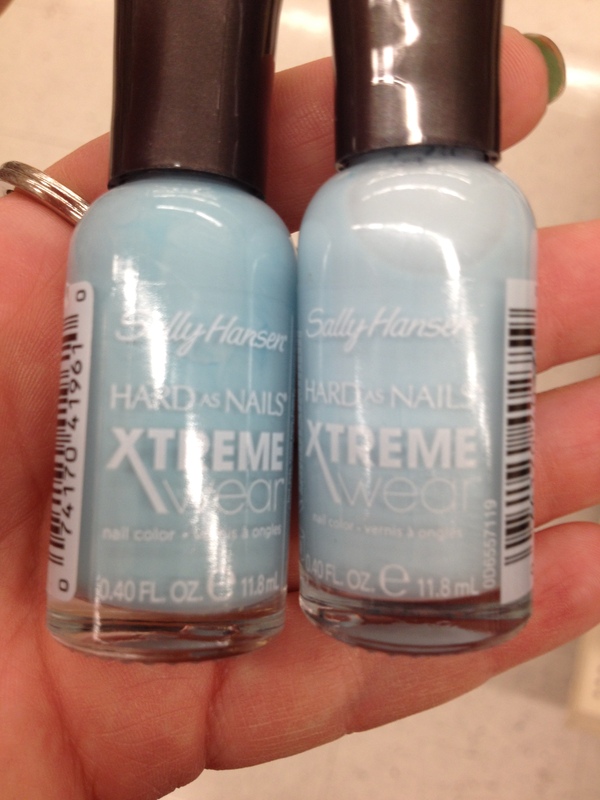 Really, Sally Hansen. I think you can be a little more creative next time. If your limited edition collections are going to feature colors that are so similar to colors in your regular line, at least put some shimmer in them, or make them a jelly formula or something. 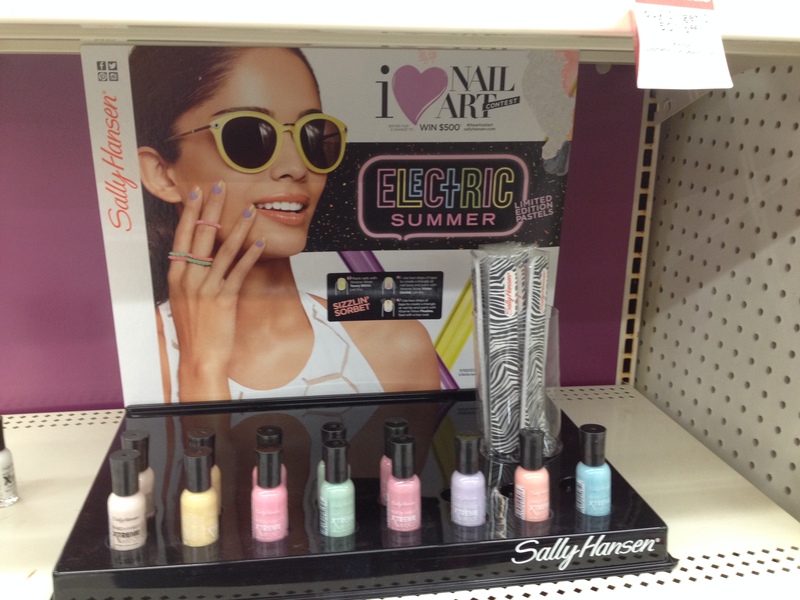 Ultimately, I didn’t buy any of the Electric summer collection, because I didn’t feel like any of the colors was really new or exciting or unique. If I would have bought any of them, it would have totally been Floaties, the pretty peach color that is second from the right in the display… But I didn’t buy it, so I guess I didn’t love it that much. Anyway, what do you think of this collection? Have you tried any of the colors?